Philadelphia, March 1, 2017 – Tanner Duckrey Elementary School students made a detailed presentation to Philadelphia City Council President Darrell L. Clarke (5th District) explaining why their school needs a new playground. The fourth graders, who are part of the Young Heroes Outreach Program at the National Liberty Museum, made the case that a new playground for their North Philadelphia school would be good for their physical and mental well-being and would help them “make healthy choices” in their lives. Their presentation also included a video interview with the school’s nurse on playground safety and common injuries. 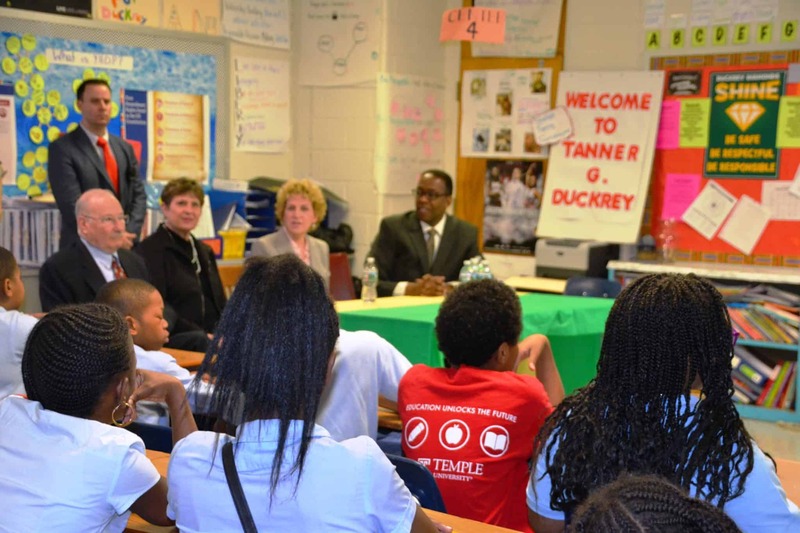 Council President Clarke assured the students that he would work with the School District of Philadelphia and the Sheller Family Foundation to make the students’ dream of a new playground a reality and that the students would have input on the design.